See what is thought to have been the birthplace of theatrical representations in Athens at Theater of Dionysus. Situated on the south slope of Athens' Acropolis, the oft-overlooked site dates back to the 4th century BCE. Although smaller and less restored than many of the city's ancient attractions, the open-air theatre has great historical significance. Wander through the remains of this mighty complex, which would have once seated an audience of 17,000, and imagine the spectacles that took place here. It's a good idea to bring some water and sun protection with you. 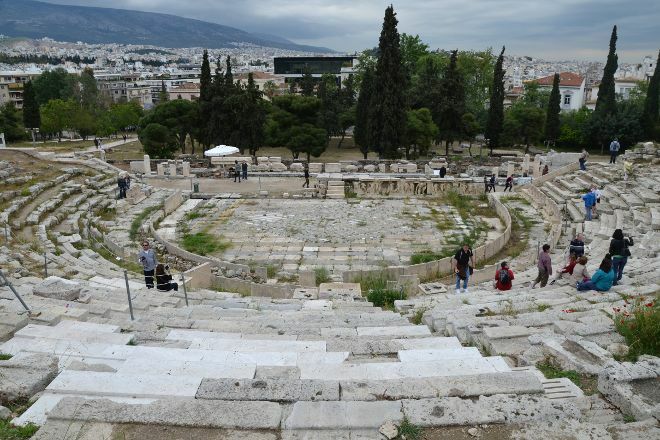 Use our Athens route planner to visit Theater of Dionysus on your trip to Athens, and learn what else travelers and our writers recommend seeing nearby. This site is included in the price of the ticket of the Acropolis (the one with all the ancient sites). In fact if you want to make the Acropolis, take the ticket down at the entrance of the theatre of Dionusos save you queuing up. In addition, you can connect the Acropolis directly from this site in amount. A nice place with a very nice theater. Especially seen from above. You can access the bleachers and hear what is being said down. The seats in the front row are very well preserved. The visit is fast. I don't know if I can get close enough. From top to bottom, it's complete, and you hear that there's going to be a performance here, and if there's an opportunity to be able to appreciate it, it's an unforgettable experience. So awesome to see that this Theatre is still standing in the condition it is in! Fellow theatregoers and aspiring actors, you must make this a bucket list place to see!!! Gorgeous! If you want a phenomenal bird's eye view of this place, follow the signs and you can use the guided steps and handrails the employees will show you. Beautiful and breathtaking. It is high up though, so please be careful when you observe this by yourself or with a friend or two. Sight is magnificent standing atop acropolis. The view is breathtaking. It was the first theatre ever built, cut into the southern cliff face of the Acropolis, and supposedly birthplace of Greek tragedy. The Theatre of Dionysus Eleuthereus is a major theatre in Athens, considered to be the world's first theatre, built at the foot of the Athenian Acropolis. Theatre could seat as many as 17,000 people with excellent natural acoustics, making it an ideal location for ancient Athens' biggest theatrical celebration, the Dionysia. A real acoustic wonder.